Have you heard the news? Starburst Mirrors are a making a serious comeback! Prefer gold, silver, brass or jeweled? Well, we have you covered. We are loving the versatility of this wall decor and creative design that the starburst shape adds to a wall. Weather you are going casual for a family room or intricate for a dining room, a Starburst Mirror will make a perfect addition to your home, adding character and charm. We adore a sunburst mirror as a focal point, hung above a headboard in a boudoir. 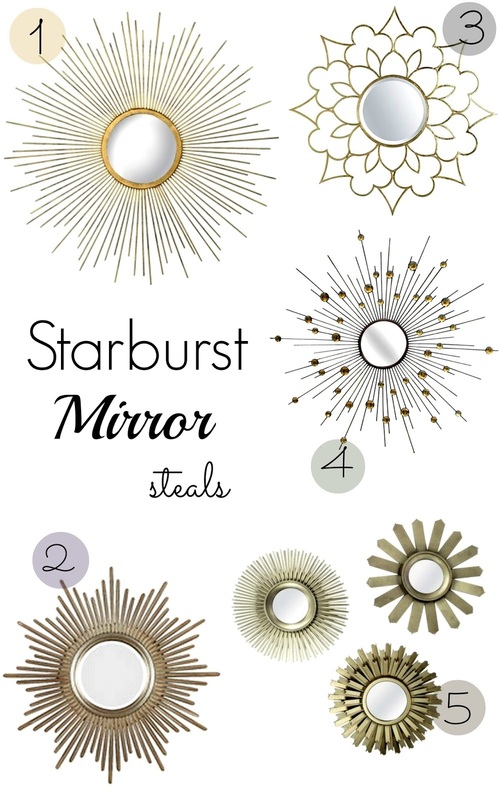 Check out our favorite picks and how we styled our Sunburst Mirror– just a little obsessed! 3. Pier 1 Imports Champagne Burst Mirror// $99 on sale now!